Hand Readings of famous people: Does Charlie Sheen have an addictive personality? Charlie’s hands show significant differences between his left (click here for picture) and right (click here for picture) hands and this tells us that he’s changed, and unfortunately, his hands show that he changed for the worse. The most significant changes in Charlie Sheen’s hand in his thumb, headline and the finger of Jupiter. The headline on his left passive hand may not show a high intelligence, but at least it shows clarity and common sense. On the right hand the headline is not balanced and appears to deteriorate even further as he grows older. This type of headline usually shows confused and illogical thinking which is confirmed by the thumb phalanges. His will phalange is far too long, but again this is not so on his left hand which means that this is not an inherited quality. When it comes to the characteristics of an addictive personality (in the list above), Charlie Sheen’s hand show some evidence of low self-esteem on his left passive hand (Jupiter finger shape and setting) but this is not evident in his right active hand which means he is not like that today in a significant way. However, cautiousness and inner shyness can be seen (Head and Life Lines joined together considerably) in both the hands. When it comes to “sensation seeking, or wanting to try new experiences”, Charlie Sheen’s hands do not show this particular quality, at least from what I can see from the shape of his hand and fingers. Perhaps this is evident in the lines, but I do not have a photo which shows this clearly. What Sheen's hands do show is a craving for attention (the shape of Jupiter and Apollo fingers on his right hand). Attention seeking behavior is something that developed due to an increased desire for control and the limelight. A good Headline can usually temper this quality and the right type of will can channel it into something productive, but this is not so in Charlie’s case. 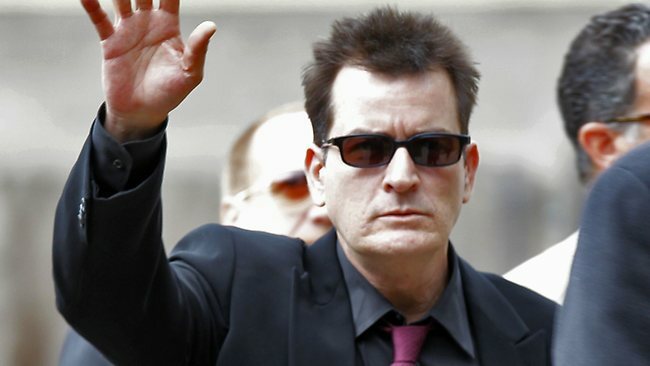 When it comes to “impulsiveness,” Charlie Sheen’s hands do not show excessive impulsiveness (thumb shape). It is his faulty thinking that’s the problem. In fact, his hands show him to be a master manipulator! He plans and plots, and often what may across as “impulsive” could well be planned for some grandiose plan that he has in mind. The “disinhibition (poor control over behavior)” is clearly shown by his Headline and the Thumb gives him the stubbornness to push through with the faulty actions. And yes, Sheen is more than averagely aggressive (Mars mounts and big thumb) but this by itself is not bad. How this aggression is channeled is the key. In conclusion one can say that while Charlie Sheen’s hands show some of the traits of an addictive personality, the most harmful traits are his difficulty with logical reasoning and also his stubborn will. Neither of these traits are inherited. There was something in his upbringing which made him like this. More Readings of television actors: What Jennifer Aniston's hands show about her personality and temperament Or The difference between Jensen Ackles and Jared Padalecki from the TV serial "Supernatural" or check out the hand readings of other actors and celebs from Hollywood. Thronging the limelight, getting addicted to fame and glitz. Don't you think addiction is a basic trait with humans? Anyone gets addicted to fame, money, etc. I guess if we attain his position, we might get addicted as well. In that sense, is it the circumstances that decide our actions or our inner traits? I don't know many film personalities who are modest. Of course, some are. I know what you mean, it's a natural human tendency but the final thing is how we handle it. Whether we get carried away or whether we let common sense dictate. People are often somewhere inbetween but some get completely blinded. And whether they do or not depends a lot on their basic common sense and logic or lack of it. Nita, why don't you write an article on 2012? 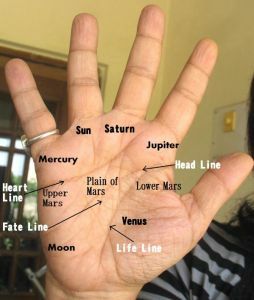 I know its not directly related to palmistry, bit since you have seen many lines in many hands, is there a common trait/ change that these lines show at a certain age (which coincides with 2012)? DI, I am not sure what you mean. But if you suggesting a write-up relating to the new years, I wanted to do something too, but right now cannot think of what! ..while i am at it more questions come to the surface..see i am a mystique..nothing gives me more pleasure than reading about it researching about it..so here's another study that i want ur opinion on..which deals reading forehead lines...a concept..explored in india as u know ..and also conceptualised by a italian mathematician..called girolamo cardano...if uve not heard of him..then here's a link...http://www.skepdic.com/metoposc.html..
Altantis, I have read a little about face reading and other similar things but as you know there is not authentic body of work available on the subject. About fingerprints - I do fingerprint analysis as well. It is part of hand reading and very accurate. About forehead lines, I have never heard of it and neither would I give any credence to it because there is not extensive body of work on this.